beginners Archives - HexByte Inc. In this tutorial, you are going to learn the basics of Vue.js. While we learn, we are going to build a Todo app that will help us to put in practice what we learn. 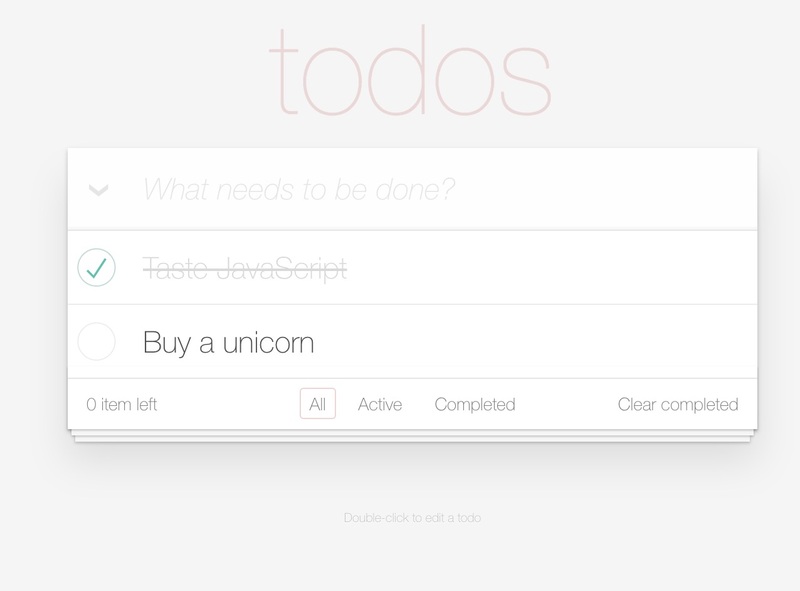 A good way to learn a new framework, It’s by doing a Todo app. It’s an excellent way to compare framework features. It’s quick to implement and easy to understand. However, don’t be fooled by the simplicity, we are going to take it to the next level. We are going to explore advanced topics as well such as Vue Routing, Components, directives and many more! After running npm start, your browser should open on port http://127.0.0.1:8080 and show the todo app. Try to interact with it. You cannot create a new Todos, nor can you delete them or edit them. We are going to implement that! Open your favorite code editor (I recommend Code) on vue-todo-app directory. We installed Vue and VueRouter dependencies. Also, we have the nice CSS library for Todo apps and live-server to serve and reload the page when we make changes. That’s all we would need for this tutorial. Line 9: Loads the CSS from NPM module node_modules/todomvc-app-css/index.css. Line 23: We have the ul and some hard-coded todo lists. We are going to change this in a bit. Line 73: we have multiple script files that load Vue, VueRouter and an empty app.js. It’s reactive because the data and the DOM are linked. That means, that when data changes, it automatically updates the DOM. Let’s try that! If you have npm start running you will see that the title changed! You can also go to the console and change it todoApp.title = "Bucket List" and see that it updates the DOM. elements with each of the elements in the data.todos array. Let’s do the CRUD (Create-Read-Update-Delete) of a Todo application. As you can see everything starting with v- is defined by the Vue library. tag that was just a placeholder. We are going to implement the create functionality. We have a textbox, and when we press enter, we would like to add whatever we typed to the list. Protip: since v-on: is used a lot, there’s a shortcut @. E.g. Instead of v-on:keyup.enter it can be @keyup.enter. <input class="new-todo" placeholder="What needs to be done?" If you click the checkbox (or checkcirlcle) we would like the class completed to be applied to the element. We can accomplish this by using the v-bind directive. v-bind can be applied to any HTML attribute such as class, title and so forth. Since v-bind is used a lot we can have a shortcut :, so instead of v-bind:class it becomes :class. Now if a Todo list is completed, it will become cross out. However, if we click on the checkbox, it doesn’t update the isDone property. Let’s fix that next. The todos have a property called isDone if it’s true we want the checkbox to be marked. That’s data -> DOM. We also want if we change the DOM (click the checkbox) we want to update the data (DOM -> data). This bi-directional communication is easy to do using v-model, it will keep it in sync for you! If you test the app now, you can see when you click the checkbox; also the text gets cross out. Yay! You should see the update. Cool! We want to double click on any list and that it automatically becomes a checkbox. We have some CSS magic to do that, the only thing we need to do is to apply the editing class. Similar to what we did with the completed class, we need to add a condition when we start editing. We created a new variable editing in data. We just set whatever todo we are currently editing. We want only to edit one at a time, so this works perfectly. When you double-click the label, the startEditing function is called and set the editing variable to the current todo element. When data.editing matches the todo , then we apply the CSS class. Try it out! If you try it out, you will notice you can enter on edit mode, but there’s no way to exit from it (yet). Let’s fix that. First, we want the input textbox to have the value of the todo.text when we enter to the editing mode. We can accomplish this using :value="todo.text". Remember that colon : is a shorthand for v-bind. finishEditing: applies changes to the todo.text. This is triggered by pressing enter or clicking elsewhere (blur). cancelEditing: discard the changes and leave todos list untouched. This happens when you press the esc key. Let’s go to the app.js and define these two functions. Cancel is pretty straightforward. It just set editing to null. finishEditing will take the input current’s value (event.target.value) and copy over the todo element that is currently being edited. That’s it! It’s always a good idea to trim user inputs, so any accidental whitespace doesn’t get in the way with textbox.value.trim(). That’s a little ugly to stick out all that logic into the template. That’s why Vue has the computed section! You might ask, why use a computed property when we can create a method instead? Computed vs. Methods. Computed properties are cached and updated when their dependencies changes. The computed property would return immediately without having to evaluate the function if no changes happened. On the other hand, Methods will always run the function. Try completing other tasks and verify that the count gets updated. The v-show will hide the element if the expression evaluates to false or 0.
v-show and v-if looks very similar, but they work differently. v-if removes the element from the DOM and disable events, while v-show hides it with the CSS display: none;. So, v-if is more expensive than v-show. If you foresee the element being toggling visibility very often then you should use v-show. If not, then use v-if. We can hide the footer and central section if there’s no todo list. On every refresh, our list gets reset. This is useful for dev but not for users. Let’s persist our Todos in the local storage. Local storage vs. Session storage. Session data goes away when you close the window or expire after a specific time. Local storage doesn’t have an expiration time. localStorage.setItem(key, value): key/value storage. key and value are coerced into a string. localStorage.getItem(key): get the item by key. localStorage.removeItem(key): remove item matching the key. localStorage.clear(): clear all items for the current hostname. We have to use JSON.parse because everything gets stored as a string and we need to convert it to an object. getItem will retrieve the saved todos from the localstorage. However, we are saying it yet. Let’s see how we can do that. For saving, we are going to use the Vue watchers. Vue watchers vs. Computed properties. Computed properties are usually used to “compute” and cache the value of 2 or more properties. Watchers are more low level than computed properties. Watchers allow you to “watch” for changes on a single property. This is useful for performing expensive operations like saving to DB, API calls and so on. This expression watches for changes in our todos data. Deep means that it recursively watches for changes in the values inside arrays and objects. If there’s a change, we save them to the local storage. The last part to implement is the routing! However, for that, we need to explain some more concepts and will do that in the next post. In the next tutorial, we are going to switch gears a little bit and go deeper into Vue Components, Routing, and Local Storage. Stay tuned!